/ Azione Riscrivente - Benvenuti su antonellaaprile! da cui crediamo di leggere la realtà. During the residency months I could investigate the vision mechanisms and their tangible transposition into space. Therefore, not only did I move inside my artwork and my habitual actions, but I also highlighted the subtle relations connecting my works to each other in a wide space; I kept and confirmed the speculative epicentre which gave birth to all the works. During the exhibition set up I made a site-specific intervention to define a united environment to be explored in order to revisit the mental and associative passages which led me from the creation of an artwork to another. I used some adhesive tape of an intense light blue color to travel along a part of the installation elements of the displayed works. 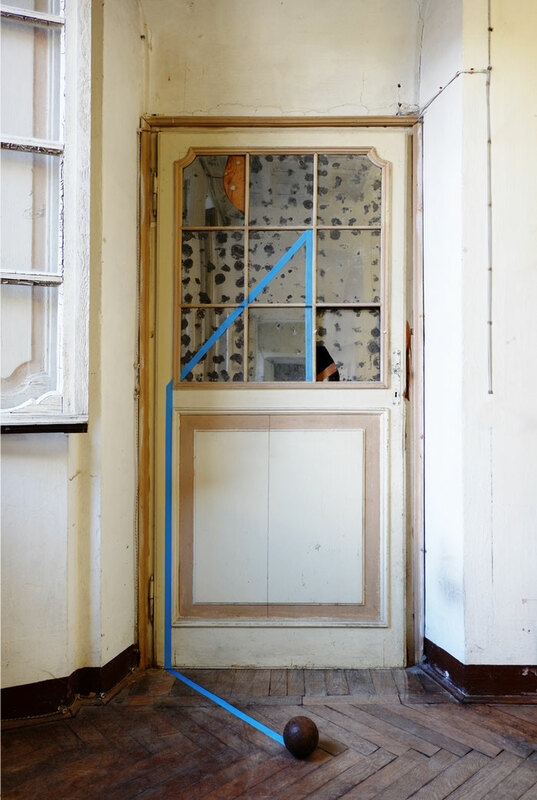 The tape crosses the floor and creates a geometric form beside the artwork “Workbench”, which functions as a connector between the sequence of panels of “Mental Forms”, on one side, and the big paperwork “Paesaggio interrotto”, on the other side. In the end, the tape reaches the wall as a right triangle inside the wooden grid supporting the long glass wall of the residency building. The geometric and symbolic entity compared to the phenomenal Nature, which has emerged in many different outcomes in the production during the months spent at NKD, reaches its objective configuration. 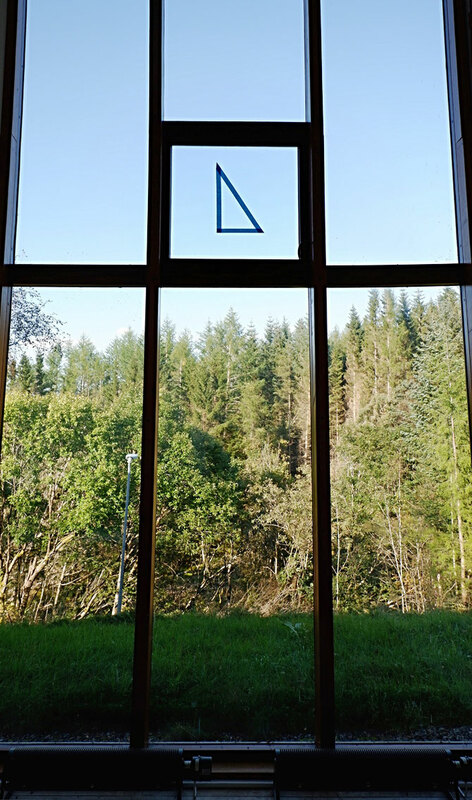 The triangle shows itself as a real figure and it stands out against the Norwegian landscape beyond the glass. With this last intervention the binomial concept becomes an empirical and tangible fact of nature – but just from one side of the glass, that is from the position from which we believe we read reality.